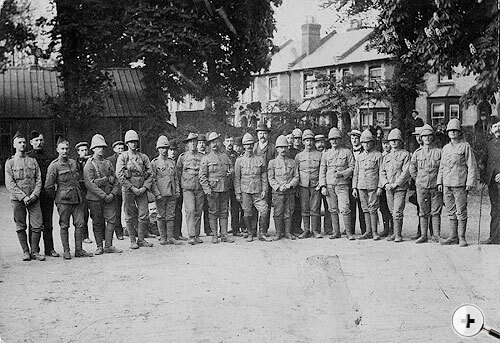 In the late nineteenth century military volunteer units were flourishing in various of the country and Surrey was not lacking in this respect. 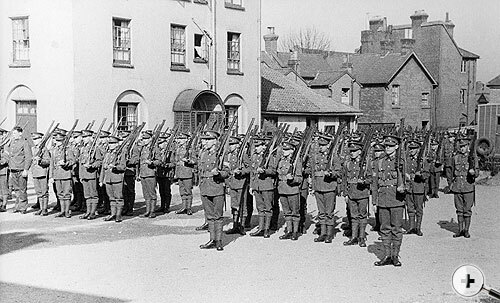 Rifle Companies were formed at different locations in the county, principally at Guildford, Reigate, Dorking and Farnham and these eventually became Volunteer Battalions of The Queen's (Royal West Surrey) Regiment. Headquarters of the 2nd Battalion were originally at Reigate but on its being appropriately moved to the county town of Guildford it was felt that proper prestigious accommodation was required and it had become a matter of urgency by 1891. 5th Battalion The Queen's Royal Regiment, Church Parade. A suitable building, capable of transportation and re-erection, was located in far away Edinburgh where it had been used to form the "Japanese Village" at the Edinburgh Exhibition! Cost of moving and erecting the building was to be £1,000 plus £1,500 for the land on which it was to stand - a total of £2,500 which was a considerable sum in those days. Major Dixon and brother officers patriotically loaned the first £1,000 and it was hoped that public subscriptions would raise the balance of £1,500 as well as repaying the £1,000 loan from the officers. The building survived its journey to Guildford, apparently without difficulty, and was erected in the grounds of East Sandfield House on a 21 year lease basis with option to purchase. The house itself became the residence of the Sergeant-Major and Drill Instructor, with a room provided for the officers and battalion offices within the precincts of the building. A convenient club was erected adjoining the drill hall. The hall was 120ft long by 52ft 6ins wide and thus of sufficient size for drilling the Battalion. It was built of corrugated iron and wood and was paved with wood blocks. Interior height was about 18ft. 5th Queen's parade at Sandfield Terrace, Guildford 1939. The formal opening, by Colonel Hercy, Commander of the 2nd Regimental District, took place on the evening of 18th July 1891. In the "absence of Colonel Drewitt at the Assizes" the parade was under the command of Major Dixon. Representative officers of other Surrey units were present as were the Mayor and Mayoress of Guildford and civic and church dignitaries. Music was provided by the band of the 3rd West Surrey Regiment under Bandmaster Gardner. 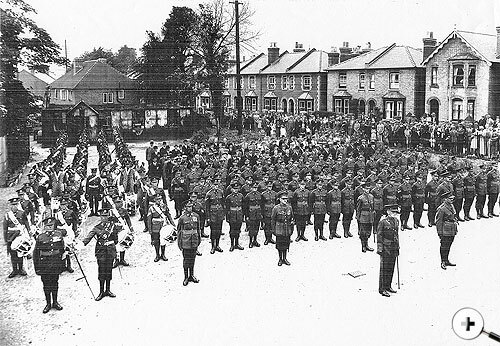 After inspecting the parade Colonel Hercy paid tribute to the high standards of efficiency and zeal of the Battalion and said he was confident that the town of Guildford would give help and support to the Volunteers. The Mayor said he believed the Corps was worthy of such a building and that he looked on it "as one of the bright comers of the district (cheers)". The remainder of the evening was spent in listening to pleasant selections by the band. 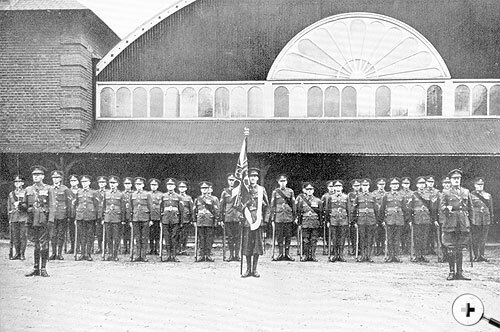 Thus began the history of Sandfield Terrace Drill Hall which was to serve the military and civil elements of Guildford for many years to come. Sources - Surrey Advertiser and County Times 1891.